The son of Atlanna (Nicole Kidman), Queen of Atlantis, and a human named Tom Curry (Temuera Morrison), Arthur (Jason Momoa) is the heir to the throne of Atlantis. Arthur, however, has no desire to live among the Atlanteans. He prefers spending his time on land with his father, occasionally taking to the water to stop pirates or perform other heroic deeds. As word of his actions spread on land, he became a local celebrity known as Aquaman. Beneath the surface, King Orm (Patrick Wilson), the current King of Atlantis, is planning to wage war on the land dwellers. In order to begin his war, he must get approval from four of the seven kingdoms of the sea. Orm’s first recruit is King Nereus (Dolph Lundgren). Once Nereus joins Orm, the two kings begin their quest to get the other kings to join their ranks, by any means necessary. Mera (Amber Heard), hoping to stop Orm from starting a war, heads to the land to persuade Arthur to claim his throne. Reluctant until things hit too close to home, Arthur teams up with Mera to find the trident of King Atlan (Graham McTavish). This trident may be their only hope of stopping Orm and saving both the human and Atlantean worlds. 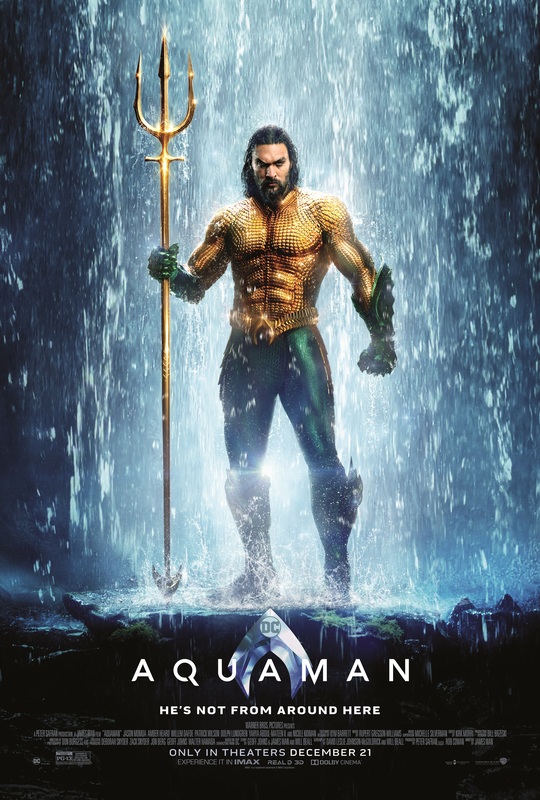 Long maligned as the lamest hero of the Justice League, Aquaman breaks out of that perception, joining the ranks of Wonder Woman as one of the few successful DCEU movies. Just as it would be impossible to picture anyone other than Robert Downey Jr. as Iron-Man, I really can’t imagine anyone other than Jason Momoa in the role of Aquaman. He has the physique of a demigod, obviously. And he brings a charm and humor to the film that has been sorely lacking from most of the DCEU films. At the same time, he’s Jason Momoa, so he does a fair amount of the fighting. Amber Heard also gets into the mix, not afraid to get her hands dirty. Surprisingly, Nicole Kidman doesn’t shy away from action when needed. Sure, it’s CGI, but it works. Kidman plays a mother who would do anything for her son and her husband, despite the costs. Let’s get something out of the way quickly. In the cartoons, Aquaman’s biggest power was the ability to talk to fish. Not exactly flashy stuff. There are a few nods to this, even the way it is represented, in the film. It plays a more minor role, coming into play only a couple times. Instead, Aquaman has become a skilled fighter thanks to the tutelage of Willem Dafoe’s Vulko. His weakness, if you can call it that, is that he has spent almost all of his time on land, not as familiar with underwater fights as, say, Patrick Wilson’s King Orm. It seems the DCEU is finally finding its legs. Aquaman follows the lead of Wonder Woman and even Marvel’s Avengers films in terms of tone and enjoyability. It is a fun adventure that really needs to be seen on the big screen to really appreciate it. A good portion of the film is spent underwater, which makes a 3D showing a worthwhile splurge. It really helps the action jump off the screen. Even though we’ve seen him in action already, Aquaman gives us a thorough, and highly entertaining origin story for what was once considered one of the least appreciated super friend.